The world surely needs our compassionate leadership. But if we are stuck in paralyzing guilt, fear or despair, how can we possibly step forward powerfully? Let us learn from the rich story of the ancient Sumerian Goddess Inanna, the Queen of Heaven who embodies the beauty and majesty of sensuality in the upper world of light, and her underworld sister Ereshkigal who embodies the harsh and unrelenting ways of death in the world of shadow. When Inanna chooses to visit the Queen Below, Ereshkigal gives her death and has her hung on a hook in the underworld. Their story of power struggle, liberation and forgiveness requires trust, a bit of grace, and whole lot of compassion. How might we see these two Goddesses within ourselves? What is possible when we learn to let ourselves off the hook? How much more healing can we bring to the world when we are free? This forty minute keynote speech weaves together the wisdom of this ancient myth with personal stories and reflection of our shared experience in our current era. Themes of individual and collective power are explored for transformation on a personal and cultural level. Learning about the relationship we have with ourselves and our sisters on the path through the lens of this ancient tale is potent food for thought and great nourishment for our souls. Rev. Judith Laxer is a modern-day mystic who believes that humor, beauty and the wonders of nature make life worth living. The founding Priestess of Gaia’s Temple, an inclusive, earth-based ministry in Seattle, Washington with close to two decades of service in her community, Judith also enjoys a successful private practice as a psychic, spiritual counselor, hypnotherapist, shamanic practitioner and teacher of women’s mysteries. 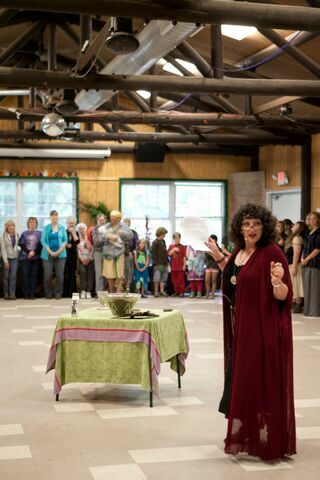 Keynote speaker and author of Along the Wheel of Time: Sacred Stories for Nature Lovers [Ravenswood Publishing], Judith has presented classes and workshops on the re-emergence of the Divine Feminine since 1993 at conferences nationally. She dedicates her work to restoring the balance between feminine and masculine energy in our culture. Learn more at www.judithlaxer.com and www.gaiastemple.org.